This fall, Disney is bringing The Lion King out of The Vault. However, they are first bringing a new and different version, a 3D version, to movie theatres for two weeks before they re-releases the movie on blu-ray disc, blu-ray 3D and DVD. 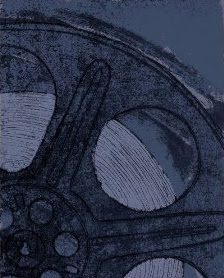 The blu-ray version will be available for purchase on October 4, 2011; the DVD version on November 14, 2011. All of the versions, of course, are available for purchase already from Amazon by clicking right here. 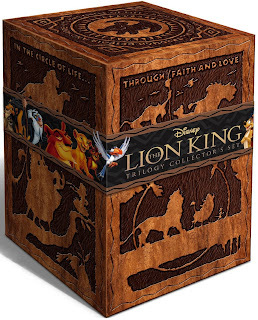 The Lion King Trilogy, as shown here, is the package that caught my eye. It includes four movies: the original 2D versions of The Lion King, The Lion King 1 1/2 and The Lion King 2, a digital copy of The Lion King PLUS the brand-new version, The Lion King in 3D. 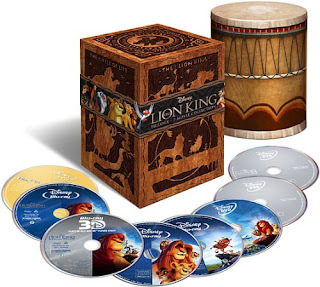 The trilogy set is packed with special features including those that come with The Lion King blu-ray release: new deleted scenes, an extended version of The Morning Report, never seen bloopers, Disney Second Screen, Pride of The Lion King, The Lion King: A Memoir - Don Hahn, Disney Sing-Along, an interactive gallery, an audio commentary and Disney's Virtual Vault: Classic DVD Features Powered by BD-Live. It also includes special features with the two other movies. The Lion King 1-1/2 features Timon and Pumbaa's Vacation Safari, deleted scenes, Timon: Behind the Legend, Before the Beginning: The Making of The Lion King 1 ½ and a music video. The Lion King 2 features include Timon and Pumbaa's Insectapedia, an animated short called One by One, Proud of Simba's Pride, Timon and Pumbaa: Find Out Why and a music video. If you want to upgrade your copy of The Lion King or perhaps buy it for the first time on blu-ray, I think The Lion King Trilogy is the way to go. It is way too soon to be thinking of next Christmas but I would be willing to bet that this will be a top-rated movie gift choice next Christmas. Buy The Lion King Trilogy from Amazon. Read more about The Lion King 2011 release options.